> News Product News Essen Excites! 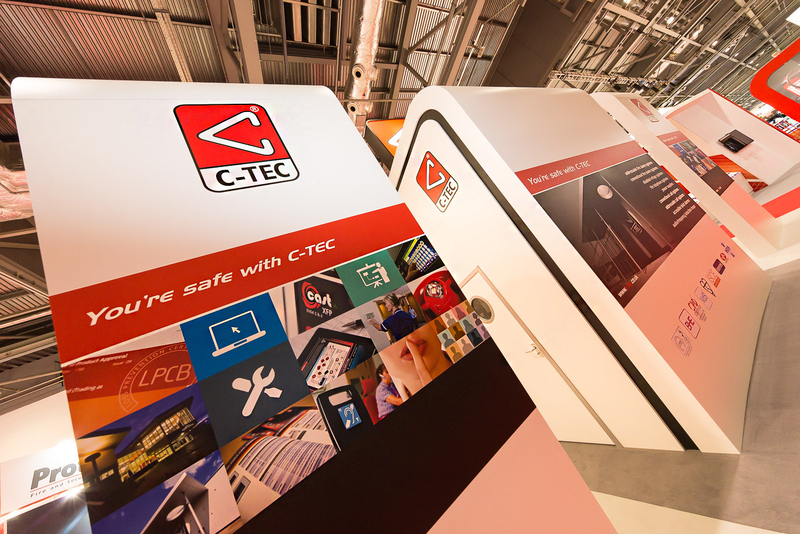 C-TEC is celebrating after yet another successful Security Essen. Located in Hall 6, the action-packed area dedicated to fire detection and live demonstrations, C-TEC’s stand featured our revolutionary new CAST-protocol XFP 1-2 loop addressable fire system, our far-reaching range of VdS-certified EN54-4 power supplies and our powerful range of 1-8 loop ZFP touchscreen-controlled addressable fire panels. We also exhibited our EN54-13 conventional fire alarm system solution and award-winning Hush Button fire alarm solution for tower blocks, flats, apartments and other HMOs. Provides fully monitored BS 5839-6 Grade C compliant fire detection, alarm, silencing and test facilities in flats & apartments. Puts residents in control of their own fire systems by allowing them to test and silence devices whilst standing at floor level. (1) EN54 certified detectors & alarms - providing commercial grade protection in domestic dwellings. (2) Cooker shut-off relays - to turn off the supply in the event of a fire. (3) Sprinkler monitoring units - to flag if a sprinkler system is isolated. (4) Remote overdoor indicators - to warn people in corridors where a fire may be taking place. (5) Communal fire systems - to report fires & faults outside the dwelling (see Networked Hush-Pro Systems tab below for details). Lifts the typical level of protection from Grade D (interlinked mains-powered battery-backed alarms) to Grade C.
Requires a HP508/PSU & field devices. An optional ZFP network device that can be used as a traditional but compact repeater panel with added functionality. Includes a Z41 Touchscreen Control Module and ZHN 'Hi-Net' multi-path fault-tolerant network PCB. Housed in an stylish flush mounting plastic enclosure measuring just 214mm x 178mm. Can be used to an enhance a building's reception area and access points (locate your main ZFP panels out of sight and let our ZFP Compact Controllers add a touch of class to your surroundings). Full Access Level 2 functionality (silence, disable, reset, etc). Requires a separate EN54-4 boxed PSU such as C-TEC's BF360-24 1A 24V boxed PSU. Up to 64 Compact Controllers can be connected to a ZFP network (each controller classed as 1 network node). Glazed stainless steel frames (ZBEZDC/SS) and vertical and horizontal alignment plates (ZMBOXAL & ZMBOXAS) also available. C-TEC's tried and trusted XFP one loop 32 zone addressable fire alarm panel - now available with C-TEC's own digital fire alarm system protocol, CAST. With a powerful 40V 500mA loop driver allowing the connection of up to 255 CAST devices, the installation of a robust, feature-packed addressable fire alarm system has never been easier. Always thought of the XFP as an entry-level fire panel? Think again. Thanks to CAST's multiple type codes, high speed data transmission and two speedy soft addressing options (automaic via the panel or manually via a handheld programmer/device tester), it is undoubtedly one of the most powerful one loop fire panels around. This, and its ability to sit on a network of up to 8 XFP master panels, makes it ideal for use in small to medium sized stand-alone applications and larger, more sophisticated installations alike. See below for a full list of XFP/CAST features. A feature-rich touchscreen-controlled addressable fire panel available with 2, 4, 6 or 8 Apollo XP95/Discovery compatible loop drivers (see Key Features section for a full list of ZFP features). Multiple off-the-shelf variants or build your own panel using our ZFP selection charts. Rapid loop learn, flexible cause & effects and powerful system diagnostics. Hi-integrity fault-tolerant RS485 networking option allows up to 128 network nodes (64 main panels and 64 Compact Controllers). Optional 'A-Bus' expansion PCBs, paging and graphic interface facilities. Standard and Medium sized ZFPs also available with 1, 2, 4, 6 or 8 loops (1 loop variants in standard cabinet only). C-TEC's tried and trusted XFP single loop 16 zone addressable fire alarm panel - now available with C-TEC's own digital fire alarm system protocol, CAST. With a powerful 40V 500mA loop driver allowing the connection of up to 255 CAST devices, the installation of a cost-effective, feature-packed addressable fire alarm system has never been easier. Always thought of the XFP as an entry-level fire panel? Think again. Thanks to CAST's multiple type codes, high speed data transmission and two speedy soft addressing options (automaic via the panel or manually via a handheld programmer/device tester), it is undoubtedly one of the most powerful single loop fire panels around. This, and its ability to sit on a network of up to 8 XFP master panels, makes it ideal for use in small to medium sized stand-alone applications and larger, more sophisticated installations alike. C-TEC , Challenge Way, Wigan, WN5 0LD, UK Opening times: 08:30 - 17:00 GMT.